Laura Bishop of the Law Offices of John Day; Thomas W. Shumate IV of Kay, Griffin, Enkema & Colbert; and James Crumlin of Bone McAllester Norton present a check for $23,000 to Big Brothers Big Sisters of Middle Tennessee. 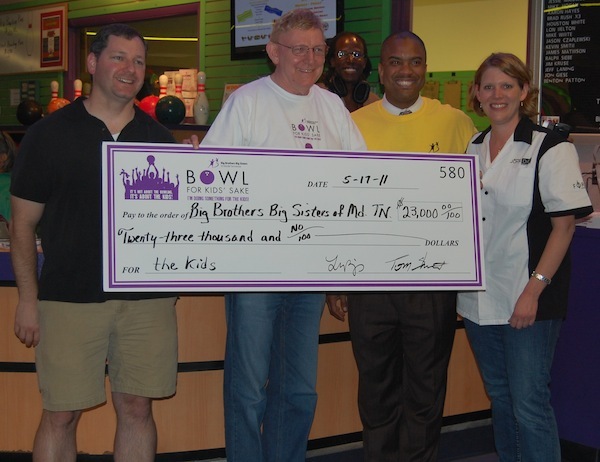 Nashville-area attorneys recently organized a bowling fundraising event that raised over $24,000 for Big Brothers Big Sisters of Middle Tennessee, one of the top two events of its kind in 2011. The “Lawyers for Littles” Bowl for Kids’ Sake event, organized by Laura Bishop of The Law Offices of John Day, P.C. ; Thomas W. Shumate IV of Kay, Griffin, Enkema & Colbert, P.L.L.C; David Wicker of Corbett Crockett; and James Crumlin of Bone McAllister Norton, took place May 17 at Hillwood Strike and Spare in West Nashville. Twenty-one teams of attorneys, law firms and other legal organizations participated to help make this year’s event a striking success. Top Fundraising Team – Kay, Griffin, Enkema & Colbert, P.L.L.C. Top Fundraising Individual – Thomas W. Shumate IV – Kay, Griffin, Enkema & Colbert, P.L.L.C. Best Dressed Team – Law Offices of John Day, P.C. Teams participating in the event were: Appellate Court Clerks – Middle Division; Bass, Berry & Sims; Big Brothers Big Sisters of Middle Tennessee; Bone McAllester Norton; Corbett Crockett; Evans, Jones & Reynolds; Frost Brown Todd; Hall Booth Smith & Slover; Kay, Griffin, Enkema & Colbert, P.L.L.C. ; Lattimore, Black, Morgan & Cain; Lawyers’ Association for Women; Law Offices of John Day, P.C. ; Lewis King Krieg & Waldrop; The Nahon Firm; NALS – Association of Legal Professionals; Ortale Kelley Herbert & Crawford; Phi Alpha Delta; Prochaska Thompson Quinn & Ferraro; Robertson County Bar Association; and Tennessee Board of Regents. Funds raised in events like the “Lawyers for Littles” Bowl for Kids’ Sake event are used to conduct background checks on volunteers to ensure child safety and to provide ongoing support for children, families and volunteers to build and sustain long-lasting relationships. The average annual cost per child to receive one-to-one mentoring services through Big Brothers Big Sisters is $1,000. Thanks to the “Lawyers for Littles” event, 23 more children will be served this year. It costs approximately $88,000 to incarcerate a troubled youth for a year, so this event potentially saved more than two million dollars of taxpayer funds. For more information on how to get involved with the “Lawyers for Littles” event next year, please contact Laura Bishop (lbishop@johndaylegal.com) or Tom Shumate (tom.shumate@kaygriffin.com).